The Embassy of Portugal in Washington, D.C., invited NMWA to participate in the “Month of Portugal in the United States” for June 2018. This initiative celebrates ongoing cultural, educational, and research exchanges between the two countries. NMWA is partnering with Museu Calouste Gulbenkian in Lisbon to present a group of works by Portuguese-born artist Maria Helena Vieira da Silva (1908–1992). If you are able to visit NMWA’s collection galleries this June, you will enjoy seeing three works on loan from the celebrated Gulbenkian Museum—two oil paintings and a tapestry—alongside two works by Vieira da Silva from NMWA’s collection. Vieira da Silva helped to shape the field of expressive abstraction after World War II in Paris, where she lived and worked for nearly 60 years. She instinctually built line, shape, and color into atmospheric, web-like compositions. 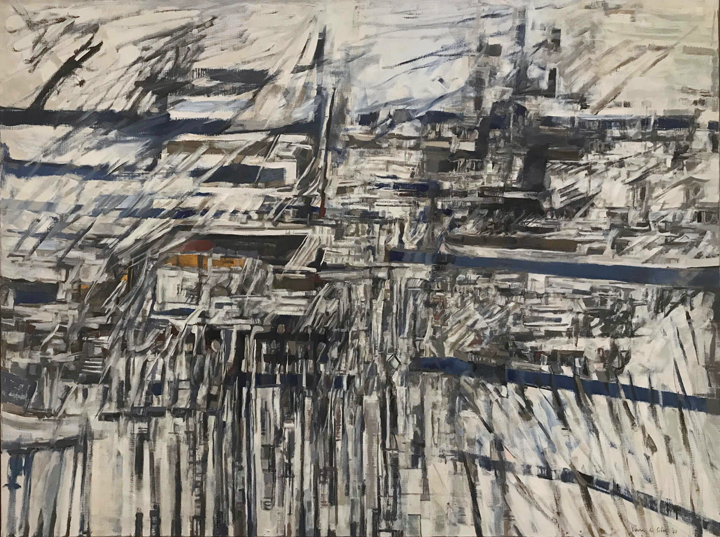 In L’aire du vent (1966), she interlaced heavy, roughly drawn lines and restricted her palette to grays and blues, evoking a sense of force that contrasts with the ethereal quality of her canvas titled L’oranger (1954), the artist’s interpretation of an orange orchard on a sunny day. Vieira da Silva designed the wool tapestry titled Janela (Window) on the occasion of the opening of the Calouste Gulbenkian Foundation’s headquarters in Lisbon in 1969. This finely woven textile was created at Portugal’s esteemed Manufactura de Tapeçarias de Portalegre. Although she was best known as a painter, Vieira da Silva’s career also included public art commissions and works in tapestry, scenography, stained glass, and illustration. 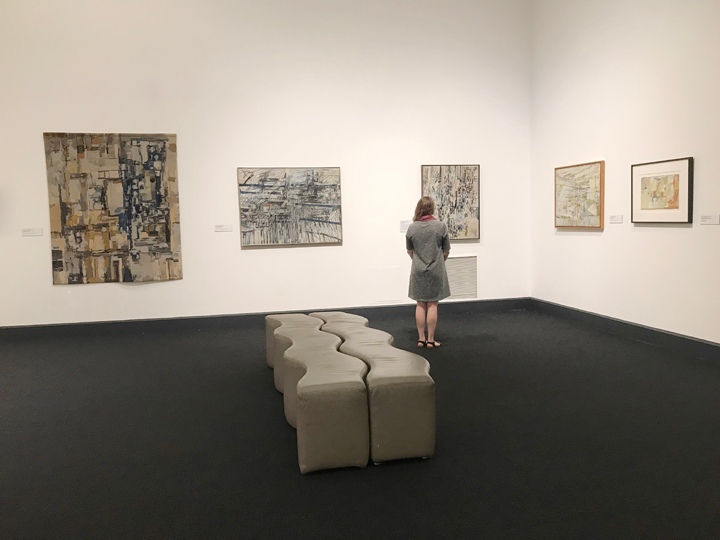 Visitors may also view works by the artist from NMWA’s collection—The Town, a dazzling oil from 1955, and an untitled gouache (1962) in shades of red and yellow, an unusually bright palette for the artist. A gift to NMWA from Dian Woodner, the gouache will be exhibited at the museum for the first time in this installation of Vieira da Silva’s art. Adapted from text by Kathryn Wat, chief curator at the National Museum of Women in the Arts. This entry was posted in News and Updates, NMWA Exhibitions and tagged Maria Helena Vieira da Silva by Women in the Arts. Bookmark the permalink.